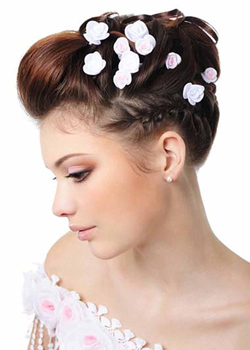 Finding just the right wedding and formal hairstyles for fine hair can create a challenge! If you are a bearer of fine hair, you know that deciding on a hairstyle for formal events or weddings takes a considerable amount of consideration. Fine hair tends to be more “slippery” than other types of hair, making it difficult to sustain a pretty up-do or hold sparkly accessories. If you are planning on walking down the aisle soon as a bride or a bridesmaid, chances are you are going to have your hair professionally done. If so, find the right stylist who has experience with fine hair and knows what you need! Keep in mind, however, that although stylists are professionals, there are a number of ways you can create a gorgeous, durable style for your fine hair that you won’t have to stress over. Read on for tips on how to get the most from your fine hair for your next formal occasion. Tip #1: Up or Down? Although an up-do is the favored style for formal hair, as it shows off the neck and dècolletè, leaving your hair down in soft curls should not be discounted. One positive in having fine hair is that it curls easily. Consider curling sections with different sized curling irons, making some tight curls here, and large, loose curls there. Tip #2: Look for elegant fine hair accessories! Headbands, petite tiaras, and rhinestone barrettes and bobby pins can make a simple style glamorous and unique. For headbands and tiaras, your local mall, formal dress shops, and beauty supply stores carry them, but just make sure to get the ones with teeth to ensure it stays in place. Make sure when choosing barrettes, that you look closely at them to see that they will grip your hair. Snap-clip barrettes are your best choice for this. FLOWERS! Fine hair couldn’t look classier than when embellished with real or silk flowers, whether you choose to wear your hair swept up or left down. Tip #3: The French braid. Many people believe this classic formal ‘do to be outdated, but we don’t think so, not with all of the new variations! It is also one of the most lovely and reliable formal hairstyles for fine hair, and ideal for weddings, galas, you name it. Today, these braids are starting from the bottom and going up, wrapping around the head, and starting as several and ending in one. Research the new techniques before heading to your stylist and consider weaving in some flowers or baby’s breath for some extra charm. Tip #4: No matter how you choose to wear your fine hair for your wedding or formal event, your style won’t hold without the proper salon hair products. If there was ever a time when more was more, this is the time. You’ve heard the tip about styling second day hair for best results (not washing your hair the day of), well this doesn’t apply to the fine-haired girl. Our fine strands soak up too much oil for that to be an option, so our best bet: fake it. Intentionally dry your hair out the day of, so that styling is more manageable. To do this: wash hair; condition (from the nape of the neck and down); apply preferred thickening or volumizing product; blow-dry until completely dry; spray hair in short bursts from roots to ends with a dry shampoo – spray from roots to ends in various spots around your head – just enough so that you can rub it in all over before brushing it back out (this dries hair out, making it easier to work with). Lastly, you don’t want to worry about your hair staying in place while you’re supposed to be having fun, so opt for a quality hairspray from your stylist. Don’t be afraid to try out the latest innovative products for fine hair – well before the wedding! Tip #5: Extensions. If you want to look enchanting on your big day, consider hair extensions. With the options available to you today, you can add some depth to your style by choosing extensions a shade lighter or darker than your current color or find your closest match to make your hair appear thicker. Even if you can’t find an exact match to your color on the rack, once it is blended with your own hair, you won’t be able to see the distinction. Extensions come curly, braided, straight, and even in pre-fashioned up-dos. However, if you have never played with extensions, it is best to have an expert do it for you or an experienced acquaintance! Tip #6: Fine hair, don’t compete with the gown! Whether you are planning a hairstyle for your own wedding, prom, or any other formal event, remember that your hair should compliment your gown. If you are wearing a strapless gown, up or down will usually work. If the event is in January and the gown has long sleeves, wear it up. Before the big day, if you are well practiced in creating the ‘do, your stress level will be at a minimum. If you are going to try and create a masterpiece yourself, or with the help of a friend or two, be sure to practice a few times so you know everything involved before the big day. If you have a stylist, make sure she knows well in advance exactly what you are looking for, all the way down to the accessories. Remember, on your memorable occasion, when it comes to wedding and formal hairstyles for fine hair, the last thing you are going to want to do is battle with your hair. Preparation is key to fret-free beauty and the perfect formal hairsyle for fine or thin hair that will go the distance.